When our friend Brandy announced her first pregnancy, I asked how she was decorating the nursery. 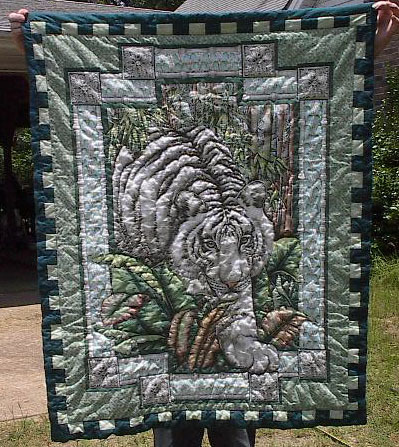 She had started a latch hook rug kit of a white tiger she intended to finish for the baby’s room to help brighten the dark green carpet. Her mother and I immediately hit a fabric store to see if we could find something to expand that theme. We found the perfect panel and I heavily hand quilted it. I added a mint and forest green checker border and hand bound the quilt in forest green. It was a hit! !